as to also allow an increasing population to make a living. swim in its muddy waters, view wildlife, or simply relax and contemplate nature. through holdings of a tourist hotel or as a guest of a private land owner. 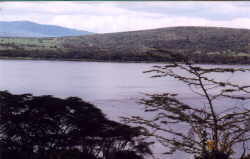 The area of Lake Naivasha was around 100 square kilometers in 1999. I first got a view and a better understanding of lake ecology when I joined an Earthwatch project entitled "Lakes of the Rift Valley" in January 2001. This photo was taken from a high point on South Road. The lake remained calm in the early morning when we began the data gathering. 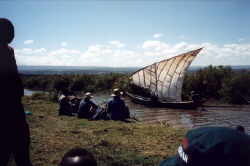 By noon clouds billowed above Mt Longenot. Back we hurried to the landing site to avoid the rainstorm. Kenyan policymakers realize that the lake could deteriorate beyond recognition in the near future without sustainable management plan. For over a decade, Dr. David Harper (University of Leicester, UK) and a team of outstanding colleagues have led Earthwatch volunteers to monitor and evaluate the effects of human use of the lake. Harper values the efforts of the Lake Naivasha Riparian Association consisting of local landowners who recognize the need to balance present uses with their future needs and those of rapidly growing populations moving into the surrounding areas. Introduced species influence lake ecology in ways not completely understood. Water hyacinth, Eichhornia crassipes, noticeably chokes sunlight from areas where it flourishes. Storms batter the floating areas to break and scatter the plants that establish in other hospitable areas. 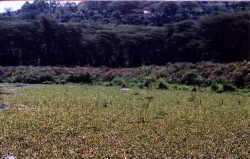 Water hyacinth, while its flower is not as lovely as the water lilies that graced the lake in the past, appears to support a rich mesofauna. We found many earthworms in the layer between the plant leaves and aquatic roots when we searched plants for crayfish in July 2002. The largemouth bass (Micropterus salmoides) were not so lucky. Sacrificed on the cutting board, the fish were sexed and measured and stomach contents examined by each volunteer in turn. 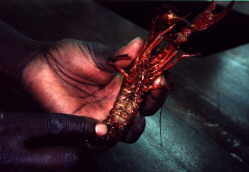 In the largest bass we found an adult crayfish recently ingested. Introduced for sport fishing bass is not a species favored in local markets. 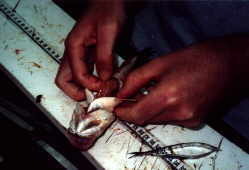 Species of choice, Tilapia zillii and the related Orechromis leucostictus, were weighed and measured in sheds located by the landing sites. 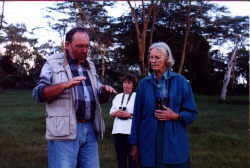 Dr. Muchuri and a group of Earthwatch volunteers interview fishermen on a site that was completely under the water of Lake Naivasha in 1997. That is how much the lake has shrunk in a few years. An even more graphic example of the change in lake surface is this photo where the landing is now more than 3 meters (15 feet) lower than it was a few years ago. 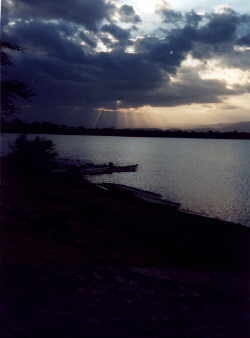 Rueben removed the boat motor while I took the sunrise photo on July 25, 2002, a place that was at the water's level in 1996.